South Africa is currently considered one of the most water-stressed countries in the world. 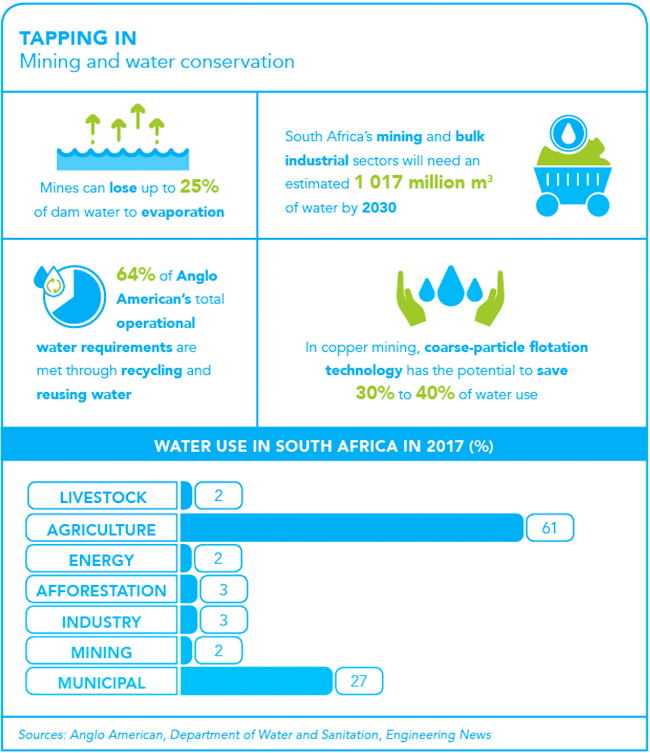 With increased water scarcity, and water restrictions in its future, the mining sector is starting to rethink its processes to become more water-wise – with the ultimate goal being the ‘waterless mine’. Increasingly, technological innovation is offering the industry a way forward. South Africa’s water crisis can only intensify with accelerating climate change – but the country is also dependent on water-hungry industry for its prosperity. The mining sector is both a significant consumer of fresh water, and a major producer of contaminated water – which, in the past, was mostly shunted into the environment in mine tailings, with damaging results for human and ecosystem health. Mines use large volumes of water in various ways, and at different parts of the production cycle. 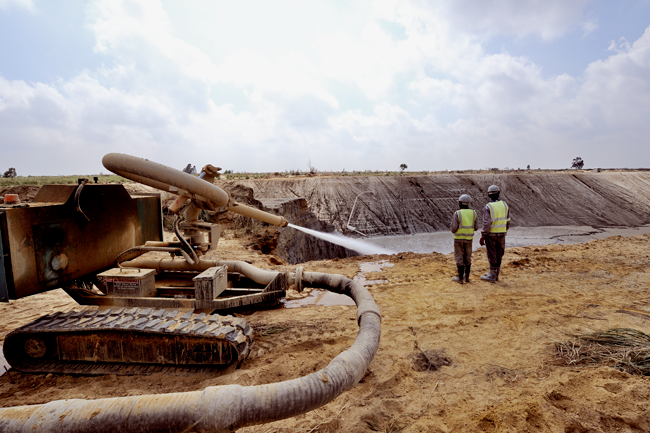 Water is consumed during mineral processing, dust suppression, slurry transport and to provide for employees’ basic needs. Mining operations also store water in dams to ensure a reliable water supply – but can lose 10% to 25% of their water to evaporation from these dams. Water for mining operations is sourced from groundwater and surface water – not made easier by the fact that much of the country’s mining occurs (and increasingly so) in remote areas that are already severely water-stressed. For example, 80% of Anglo American’s South African operations are located in water-scarce regions in the Northern Cape and Limpopo. This can cause conflict: in these arid areas, the government’s first priority is to provide safe, clean water to the local communities; and indeed, the Department of Water and Sanitation is looking to further reduce water allocations for industry. Mining companies are very cognisant of these water-scarcity issues. 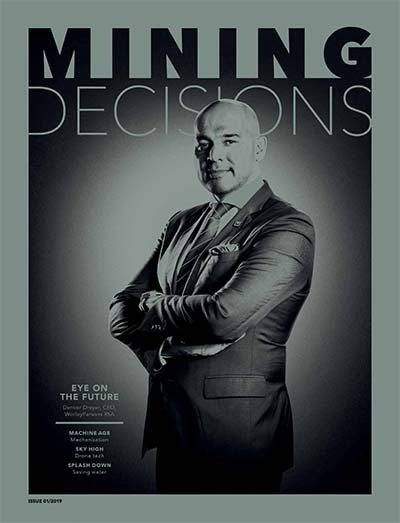 According to Garyn Rapson, partner in environment and natural resources at Webber Wentzel, the mines are ‘getting clever’ about water use; mindsets are changing, and mining companies now are ‘starting to see water as an incredibly valuable resource’. Not only is poor-quality water released by mines harmful to the environment and human health, it also impacts on the operation of the mine itself, causing damage to mining and processing equipment, and adds enormously to costly mine rehabilitation bills. One particularly deleterious problem is acid mine drainage (AMD), which occurs when old shafts and tunnels fill up with water, which then decants into the environment. When this water flows over the mineral pyrite, sulphuric acid is formed. Rivers may turn a yellow-brown colour from the iron oxide present, or turquoise from aluminium. The water is very acidic, has a high concentration of salts and contains heavy metals. This toxic AMD can cause devastation if allowed to leach into aquifers, surface water or soil. And the damage is long term: it’s been estimated that the seepage may continue for many decades, even a hundred years, after closure of the mine shafts. Highly saline water is also a problem. 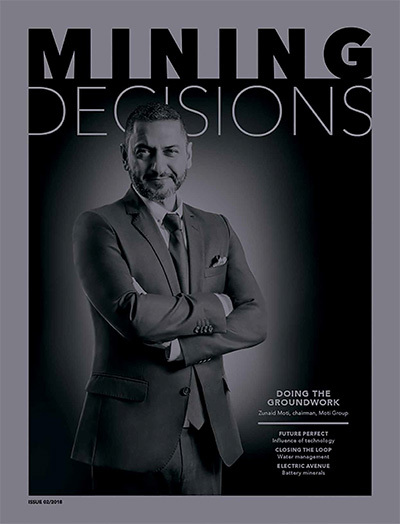 The industry is constantly seeking treatment techniques to edge closer to ZLD, without endangering the profitability of the mine. ‘New technologies are being developed all the time,’ says Singleton. ‘The challenge is that the closer one gets to ZLD, the more expensive the technology becomes.’ The mining industry is currently very interested in the potential of ‘captive water facilities’ or ‘closed-loop’ water systems. This concept is what Rapson calls ‘the flavour of the year’ in the mining industry. The idea is to prevent the dirty water escaping into the environment, either by discharge into tailings dams or by evaporation. Instead, the aim is to keep it on-site and recycle it, forming a closed-loop of water usage. Companies such as Anglo American are also exploring technologies to reduce water evaporation, another way water escapes the ‘loop’. At sites where it has too much water, the miner’s focus is on ‘reducing levels of imported freshwater’ and recycling as much as possible, according to Anglo American’s 2017 sustainability report. ‘The operation is optimising the use of treated sewerage effluent … and stormwater to reduce its clean ground-water consumption.’ At its South African mines, Anglo ‘routinely evaluates the use of municipal sewerage as a source of water, as well as desalination of sea and brackish surface water’. Another growing concept in mine water use is the potential for re-using water in commercial activities after it has passed through industrial processing. Where there is excess, treated mine water can be used to sustain other economic operations in the region, such as irrigation for farming. For example, economical technologies are being piloted with success to produce irrigation water for farmers in the Mpumalanga-based coalfields. The water can even be made safely drinkable. In some operations, says Singleton, ‘treated mine water is being delivered to municipalities as potable water’. Coal South Africa is one example. Its flagship water-reclamation plant in eMalahleni in Mpumalanga produces potable water for the eMalahleni municipality. Mine water can also be used to restore natural water sources in the vicinity. For example, water from ‘dewatering’ processes can be re-injected into aquifers to restore falling groundwater levels. At Kumba, the mine pumps water into the Vaal Gamagara pipeline in order to support regional water supply. Technological solutions are also being developed to reduce the amount of water used in the first place in processing ore, and thus sent to the residue tailings – which often represents the biggest water loss at a mine. 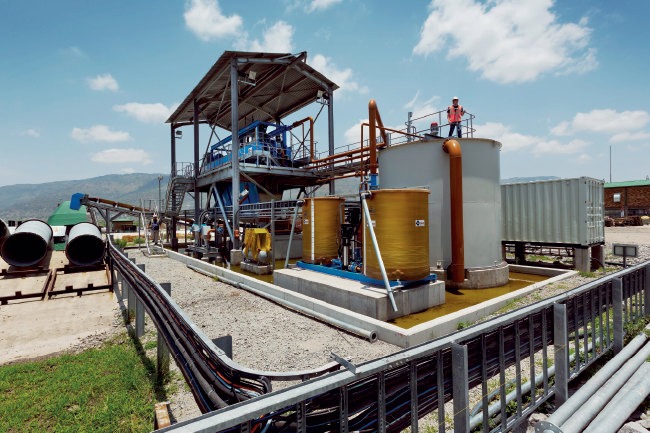 Anglo American, for example, is exploring innovative approaches to dry separation, non-aqueous processing and tailings disposal. ‘Fine particle slurries are particularly difficult to dewater and current dry disposal options have prohibitive capital and operating costs,’ the sustainability document notes. The company is now testing newly created polymers that assist in separating water from fine slurries: a low-cost dewatering technology that creates dry, stackable tailings of residue. They are also exploring ways to crush and grind ore to the required size that ‘dewaters’ the waste far earlier in the process. ‘Early estimates indicate the potential for a 30% to 40% reduction in water used per unit of mineral production. We are confident these dry processing techniques will allow us to re-use 80% of process water,’ it states. So what would an ideal water-wise mine operation look like? Most importantly, mines should aim to be self-sustaining and self-sufficient with regards to water use. ‘Mining operations should not be relying on municipal or potable water,’ says Singleton. Every mine ‘should be treating its effluent to sustain its own operations’. Another key concept is that mining operations should be conducted always with the eventual closure of the mine in mind. ‘Treatment options should as far as possible be implemented in order to sustain economic activity post mine closure,’ says Singleton. A totally ‘waterless mine’ with dry processing, perfect dewatering and ZLD may never be completely achievable. 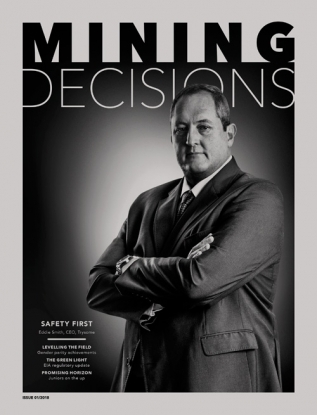 But the outlines of what an ideal, sustainable South African mining industry could be are becoming clearer.